Square rings add a new dimension to some chainmaille weaves. Because they are square, the light shines off of more surfaces causing them to highly sparkle. These rings are made of 14/20kt Rose Gold Filled Wire. This means that the wire is made of a tube of rose gold and it is filled with a metal alloy. The 14/20kt means that the outer 5 percent (the hollow tube) of the ring is 14kt rose gold. 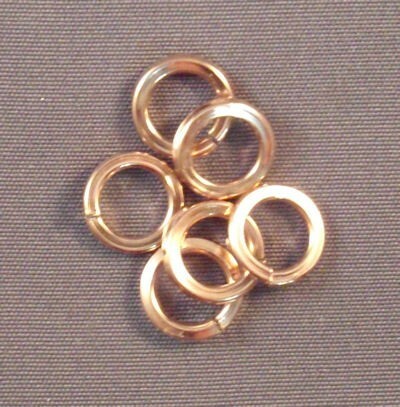 I like to use rose gold filled because it has the look and feel of 14kt gold without the cost of pure 14kt. I have never had the gold wear off as gold plated and vermeil sometimes does.